UKSEE is an entrance exam conducted at the state level in the state of Uttarakhand by Uttarakhand Technical University. This state-level examination is conducted for providing admission to various courses like MCA, BHMCT, B. Pharm, and so on. Interested students can also get the lateral entry in the second year of the mentioned courses. In the state of Uttarakhand, many government as well as private colleges will accept the score of UKSEE and will give the admission. The candidates who have passed the qualifying exam from the state of Uttarakhand only. Candidates who have domicile of Uttarakhand but are studying in other states are also eligible to appear in UKSEE 2019. B.Tech (LE) Applicant must have passed Diploma in engineering or technology/B.Sc or equivalent exam along with the minimum 45% marks in the qualifying exam. For the candidates of the reserved category, the minimum marks requirement is 40%. B.Pharma Applicant must have passed class 12th or equivalent exam with physics, chemistry and any one of the mathematics/ biotechnology/biology subjects along with the minimum 45% marks in the qualifying exam in the PCM or PCB group. For the candidates of the reserved category, the minimum marks requirement is 40%. MCA (LE) Applicant must have passed BCA or B.Sc (IT/Computer Science) degree holder with mathematics subject at 12th or graduation level. M.Tech Applicant must have passed Bachelor degree or equivalent in the relevant field along with scoring minimum 50% marks. UKSEE 2019 application form will be available online on the official website. The application form will be filled via online only. Before filling the application form, the interested candidates must check the eligibility criteria. The students have to fill and submit separate application forms if they are applying for more than one course. How To Fill UKSEE 2019 Application? On the official website, they will click on the link of UKSEE application form. The interested candidates will fill all the details which are asked in the application form. They must fill the correct and right information. They also have to upload the scanned image, but the size of the image must be as per the specifications mentioned in the application form. After filling the application form, the candidates have to pay the application fees. The candidates of General category will pay RS 1500 whereas the candidates of the reserved category will pay RS 750 as application fees. The payment can be made via net banking, credit card and debit card. This application fee is non-refundable. It is not required to send the hard copy of the application form. Exam Mode: The UKSEE 2019 exam will be conducted in offline mode which means it will be conducted via pen and paper mode. There is no online exam. Type of Questions: In the exam, there will be only Multiple Choice Questions. Duration: The applicants will have only 2 hours. Language: The candidates will have the questions in English and Hindi. Subjects: The subjects for various courses will be different and will depend on the course which the candidates have selected for taking admission. Marking Scheme: For each correct answer, the candidates will be rewarded one mark. Negative Marking: For any wrong answer, there is no provision of negative marking. The candidates will be selected for the different courses as per their performance in the written exam. The candidates will be called for the counselling on the basis of cut off marks and merit list. The syllabus for each exam will be different and it will depend on the course chosen by the candidate to give the exam. For the undergraduate level course, the syllabus will be at the level of 10+2. However, for the postgraduate courses entrance test, the syllabus will be at the level of undergraduate courses. UKSEE 2019 admit card will get released at least 1 week before the exams by the Uttarakhand Technical University. The UKSEE 2019 hall ticket will be available only for those who have successfully submitted the complete UKSEE 2019 application form. There will be separate admit card for each course depending upon the aspirant for which he/she has applied. The UKSEE 2019 hall ticket will be available online on the official website which is www.uktech.ac.in. The admit card must be kept safely by the applicants till admission. The applicants will click on the link given on the official website. They will enter the registration ID and password. Click on the tab of Submit. Admit card will be shown on the screen. They will download it and take the print out of UKSEE admit card 2019. 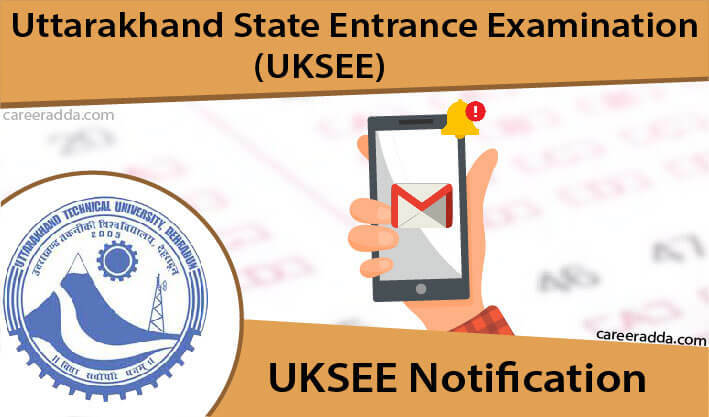 UKSEE 2019 result will get announced in the last week of May 2019. It will be released on the official website only. A separate list will be prepared for each of the course which will depend on the performance of the applicants in the entrance exam. As soon as the result will get released, scorecard and rank will also get released. To check the result, the candidates will go to the official website and click on the link of UKSEE 2019 result. After that, they will click on the course name and merit list will get appear on the screen. They will search their name. The authorities will release the UKSEE cut off 2019 after the declaration of UKSEE result 2019. The cut off will be decided by the convening authority only to shortlist the candidates for counselling process and admission. The candidates who will score the marks equal to cut off or more than that will be called for the counselling but on the merit basis. The cut off will be declared course wise.